Sargassum seaweed floods the coastline and beach at Rockley Bay recently. Bookings at hotels are being cancelled by visitors and events postponed as businesses and residents in Speyside battle with an influx of Sargassum seaweed on the village beaches. 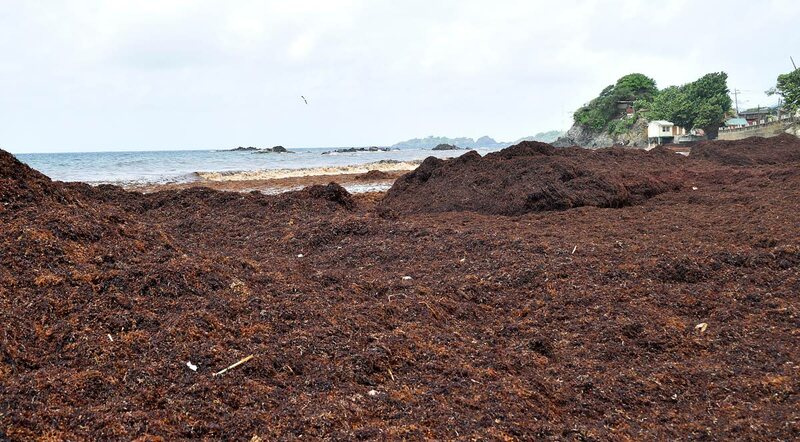 Jeanette Lovell-Gaye, Reservations Manager at Blue Waters Inn, which is located on the Speyside beach, told Newsday Tobago on Monday that the buildup of Sargassum seaweed on the beach has been more of a problem than the stench. “It is on the beach, we have guests who would have cancelled because of it, they would call to enquire if it’s still there, so we would have cancellations. And then we would have had a few guests even in the past week, last Friday, coming for week-long stays butcancelling and leaving before their time. “A lot of the guests would complain about not been able to swim because at the moment the seaweed is in the water. We have to be offering free shuttles to Charlotteville for guests who want to use the beach,” said Lovell-Gaye. One of the events that has to be postponed as a result of the influx of the seaweed was the annual fisherman fete last weekend. 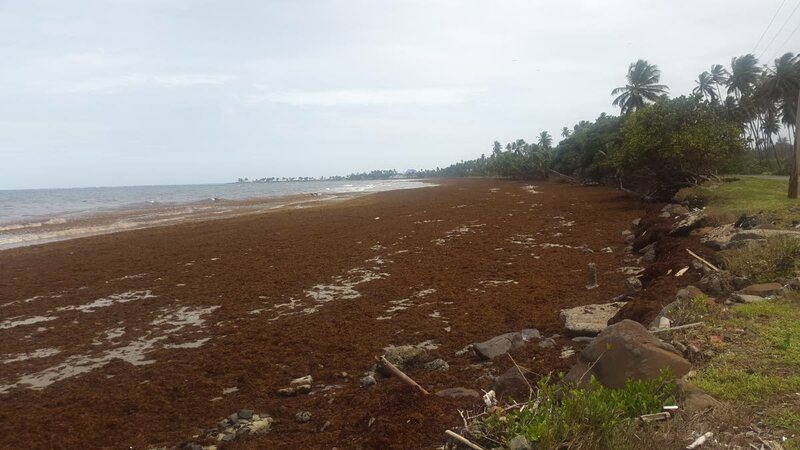 In a telephone interview on Monday, Allan Stewart, Director of the Tobago Emergency Management Agency (TEMA), said the seaweed was now present on various coastlines in Tobago, including Speyside. He noted other locations affected along the Atlantic side of the island as being Lambeau, Rockley Bay, Bacolet, John Dial, Hope, Argyle and Roxborough. Farley Augustine, THA Representative for Parlatuvier/L’Anse Fourmi/Speyside, said that he was aware of complaints about the Sargassum seaweed. “The seaweed issue is now annual, and we are at the time of the year when it is washing ashore in high volumes. We have been having some clean-up activities… up until last Wednesday, we had excavators at the beach trying to dispose of the rotting seaweed and trying to bury as much as possible, but we have some challenges. “In fact, last Wednesday when we thought that we were finished, the excavators were removed and by evening a fresh set of seaweed arrived,” he said. Augustine said that one challenge was that the rotting seaweed leaves a foul stench. He said that a long-term solution must be found for the large quantities of the seaweed washing up yearly on the shores. “It is becoming more and more expensive to use excavators as a long-term solution for removing the seaweed and keeping the beaches clean and we also have to look at… how to remove the seaweed without damaging the beach,” he said. Augustine said that the Division of Infrastructure, Quarries and the Environment has been working in the area but suggested that the THA has fallen short in not yet finding an environmentally safe, long-term solution to deal with the seaweed knowing that it was an annual problem. “They (Division) have been trying their very best, but this is now literally to a point beyond our control. We just have to continue to live with it and cope with it…,” he said. Reply to "Farley calls for long-term solution for Sargassum seaweed"